What does jewellery mean to its owner? It may be seen as a work of art, a treasured gift, a token of friendship or love, a personal adornment enhancing the appearance of both men and women or an investment. Jewellery is an important part of culture and tradition, designed to match fashion trends and clothing styles. The creation of these precious ornaments is an age-old handicraft, embedded in rich cultural traditions and handed down from generation to generation. Italy, and in particular Florence, has long been renowned for its expertise in jewellery of the highest quality. The famous Perseo School of Jewellery Art, founded by Fabio Sieni and Massimo Campaioli, attracts students from all over the world - Russia, Japan and African countries, to name but a few. The school has built up a solid reputation on the basis of the professional training courses, advanced courses and refresher courses on a range of subjects relating to jewellery and goldsmithery. It is located in the old historical centre of Florence, a city that has always been identified with art and has been the home of artists and craftsmen, rulers and thinkers who have made it famous throughout the world for centuries. Great personalities such as Filippo Brunelleschi, Donatello, Leonardo da Vinci, Nicolo Machiavelli, Michelangelo, Galileo Galilei, Catharina de Medici, Antonio Meucci and Dante Alighieri are still remembered and cherished in the capital of Tuscany for the valuable and indelible contributions they have made to global art and culture, science and technology. The teaching method, continuously tested and refined since 1998, allows excellent results to be achieved in relatively short periods. All the courses are designed to guarantee everyone adequate training for their needs, with many hours of lessons, all conducted by well-qualified teachers (craftsmen, artists, designers and professionals). One of the most talented teachers and jewellery designers at the Perseo School of Jewellery Art is 46-year-old Nadia Marchese (see her artwork in the photo at the left and the photos below). 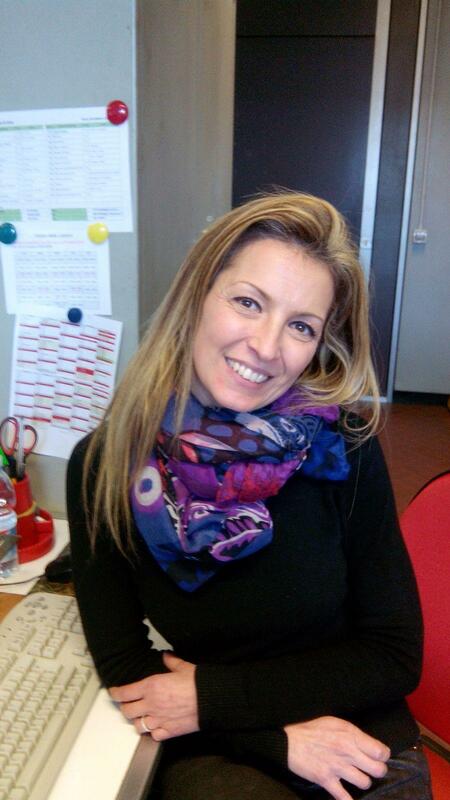 Nadia loves her job at the Perseo School, and also has her own design studio near Ponte Vecchio. Nadia enthuses: "I have been a jewellery teacher here for many years now. Before starting here, I used to teach at the Porta Romana, another famous school. It's not enough for jewellery artists to just learn how to design really good jewellery, they also need to know the basics and the technique; that's what we teach the students in our laboratory. We cannot design jewellery if we are not aware of the technical problems we might encounter. Making jewellery is not only a creative journey, it is also a very technical process. You need to be very patient too." Jewels designed by Nadia Marchese. Nadia Marchese is a fanatic when it comes to jewellery. "Jewellery is creativity, " she says, "It's my life. But again, you need to be very patient. I'm not very patient when it comes to many other things, but I am when it comes to making jewellery. That's becauase I love it. Although I don't wear much myself. Normally I wear just one ring, whereas I have ten rings at home. Making jewellery is my passion. I always loved jewellery as a little girl. I bought a ring when I was very young with the first money I earned. With that ring, my passion for jewellery was born. When I worked in a laboratory, I never took home the money I earned, but instead I received jewellery. I come from Sorrento, a city north of Naples in the region of Capania. One day my school class went on an excursion to Florence, and I remember well how astonished I was when I saw all those jewellery bottegas at the Ponte Vecchio. I was completely swept away and stood there for hours, even losing my classmates who must have gone on without me. I just had to see everything. It was then that I knew I wanted to become a jewellery designer. Florence is the most important city for jewellery in Italy. There are so many jewellery shops and laboratories here. Actually, before going to the Ponte Vecchio I should have been 'vaccinated', because I was infected by the seduction of the beautiful jewellery." Nadia Marchese regrets the fact that many great jewellery makers have left the profession, because it is difficult, also in economic terms. Nadia explains, "To earn enough money for making jewellery is not easy at all. I think that artisanal work is not appreciated anymore. It's a lot easier for people to buy jewellery made in a factory than a handicraft. These days, people are no longer accustomed to appreciating beautiful, hand-made jewellery: original pieces that are well-made. Nowadays, everything is made in factories and people buy it. It is art without soul." "It has become very difficult to ask a good price for hand-made jewellery, as you have to compete with the factory-made products, which are obviously cheaper because they are mass-produced. This also reduces the quality, and then you can't carry out this individual work anymore, because you can't work on just one ring and ask 200 euros for it. Nevertheless, I have found my place at the Perseo Jewellery School. Many important schools have since asked me to come and work for them. But I will stay here. This is our school. If I'd gone to work somewhere else, it would be as if they'd cut off my wings. And I wouldn't have been able to grow artistically either. I feel very happy in the cultural atmosphere of Florence, and especially at this school." "I work with students from all corners of the world. That gives you an additional cultural element, because you also learn a lot from the cultures of their countries. The most interesting material for me is gold, which I find the most attractive material too. As gold is good to work with, and it is malleable, it remains lucid and precious." For Nadia the most important thing about making jewellery is being able to express herself through creativity. 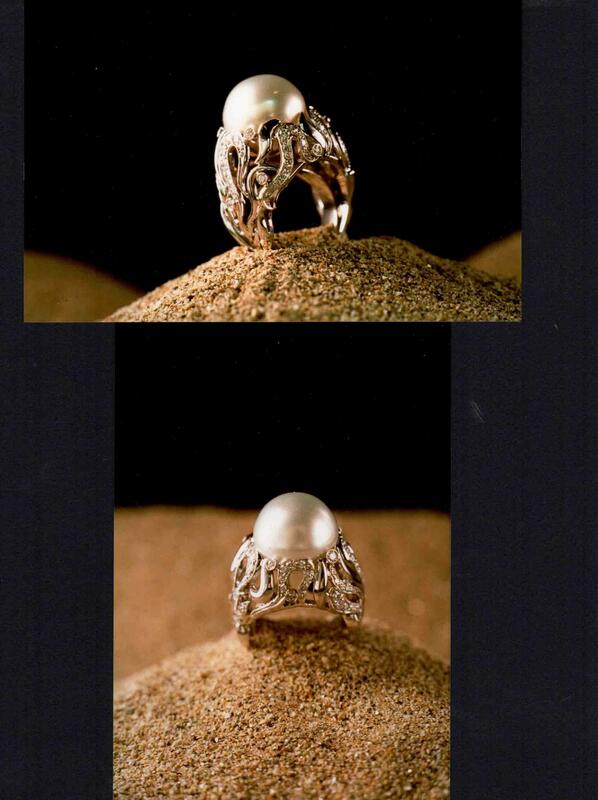 However, an important side-effect is that jewellery has the ability to embellish people. Nadia smiles: "Jewellery has always fascinated me, all my life, and I love to create hand-made objects. Of course, it has also great value in terms of embellishing a person. A beautiful woman can be adorned with jewellery to give sometinhg extra, but you also see many women, who wear so much jewellery that they look like a Christmas tree. That doesn't necessarily make them any more beautiful." The Perseo School of Jewellery Art was founded in 1998 by by Fabio Sieni and Massimo Campaioli, the latter being the Director of the school. The Perseo School has always been in this historical building in the 'Quartiere di Santa Croce', the so-called blue district of Florence. The city of Florence is divided into 4 'colour-districts': the red, the blue, the white and the green district. Massimo Campaioli shows one of his students the technique of jewellery-making. Campaioli has also been for almost 40 years a teacher in stone-setting. "I wanted to teach the Florentine style, and not jewels for mass production." Massimo Campaioli tells the story of the foundation of the Perseo school, which meant a revolution in the jewellery scene of Florence. "I have been a jewellery teacher in other schools. I taught jewellery in California and Saudi Arabia. In Saudi Arabia I directed the laboratory and in America I taught the study of precious stones. And for years I have been teaching jewellery in Florence. I worked at several other schools as a jewellery teacher and Fabio was my student. After 20 years working together, we decided to found our own school, because we were not satisfied with the way they were teaching jewellery in other schools. I was not allowed to teach how I wanted to. I wanted to teach the Florentine style, but they refused to let me do that. The Florentine style is a style which is recognized at an international level. It is a very sophisticated style, with very delicate details and a lot of handicraft. It is not a thing you can produce in series, you have to create individual pieces. Those schools wanted to teach the students to produce jewels in series. My style was working with unique pieces. For example, in my style precious stones are inserted (incassatura). I used to set the stones in the metal and then I fix it onto the metal. Stone-setting is very precise work. But the other schools didn't want it. They didn't even know how to do this actually. They knew nothing about real jewellery-making." "So we realized our ideal to start our own school and teach or own style. The Florentine style is very famous. It is a widely valued all over the world. Whether you go in Brasil or Japan, everybody knows Florence. The city is famous for its jewellery, art, history, the Florentine reputation originates from the Renaissance." The Perseo Jewellery School is promoter of the annual 'Perseo School' Prize, the only prize in Italy for jewellery where the owners are all artisans-artists. The school was founded as an association dedicated to the teaching of the culture of jewellery. A group of professionals of this sector decided to found 'Perseo' to fill in a large gap left open by public and private schools. Until then, the teaching of the art concerning jewellery and all the activities that form jewellery was normally confided to persons who were good 'managers' of any vocational school but from the artistic point of view, they had little or no personal experience in working in a jewellery workshop.Therefore, it was necessary to bring the young in contact with all the expressions that form jewellery, to recreate a Bottega Artigiana (antique workshop) in Florence, which has for centuries been a birthplace of the best traditions of this Art." Massimo Campaioli reveals the secrets of the succesful Jewellery Art School: "'This is a school where only the best students and teachers come together. The students are of a high level. The question for us teachers is: how to get out the hidden talents of those students. But, as I said we have students from all over the world: Japan, Korea, Russia, India, the whole of Europe. But I only take the best teachers, like Alberto Gallingani and Nadia Marchese. Female teachers and students are very important, especially the women are very good in jewellery-making, because they know very well how to embellish the body of the human being. Nadia is very precise. The female creativity is at a very high standard. But that is not astonishing, women are more sensible, and, after all, it are the women who give birth to human beings." "Women are better jewellery makers, because they are more sensible." Massimo continues: "The female students are the most talented. And espcially the ones from Asian countries. They have a very different, more sensible approach to jewellery. Our school has delivered many students, who made a career in the jewellery business. For example, the famous jewellery designer Gionmaria Buccellati came here to get a couple of our students to work him in his atelier in Chiasso. He has three shops in the Place Vendome in Paris. He also makes watches. He also took a Japanese ex-student of our school Takako Cassitura, and she is now leading his deparment of watches in Chiasso. Takako Cassitura was extremely good, she designed a jewel combined with a watch, it was an artistic watch, very special. It is a unique jewel-watch without pointers. She is maybe one of the best students we have ever had here in Florence. It was a great honour that he took 5 or 6 students from our school." "I am a multi-faceted person, like a diamond." One of the most fascinating designers in the Florentine art scene is no doubt Alberto Gallingani (77): painter, sculptor, art performer, poet, jewellery designer and jewellery teacher. He has been working as a jewellery teacher in the Perseo School of Jewellery Art for some 15 years. Alberto Gallingani was born in Florence, where he still lives and works. After an initial period of formative pictorial experiences of a realist nature, in 1961 he came into contact with artist of the Florentine abstract movement and in particular with Vinicio Berti, with whom he completed his training and also developed and fully realized his artistic experience within the context of the Pittura di Nuova Realtà (New Reality Painting movement). In the same period, he frequented Fiamma Vigo's "Numero" Art Gallery where, at a young age, he held his first solo exhibition as a painter. Alberto says: "I am a painter and sculptor with a specific interest in jewellery-making, because I consider jewellery a specific language, just like painting and scupture. Because a jewel, just like a picture, determines the state of the soul. But my passion for jewellery-making was born maybe at the age of 18, after I had been painting for 2 years. It has been an impulse, an 'object of love' which was inside me and that came out. Without knowing it. My master in jewellery was Renato Cacciali , a Florentine. Renato has been the one who taught me the technique of jewellery-making. He taught me all the secrets of jewellery-making in his laboratory. He made rings, broches, bracelets, necklaces, earrings. And then, at the age of 22, 23 I started as a jewel designer. I was also very much inspired by Giorgio de Chrico. He was a great Italian artist, born in Athens. He was only 25 when he painted the surrealistic art work 'The Uncertainty of the Poet", a year after coming to Paris."